Transparency is paramount to the success of any organization. Cultivating an environment of transparency ensures that your company is accountable and remains committed to your mission, while also building credibility with your customers. It can be difficult and daunting to facilitate such an environment at a larger organization with a constantly expanding staff. 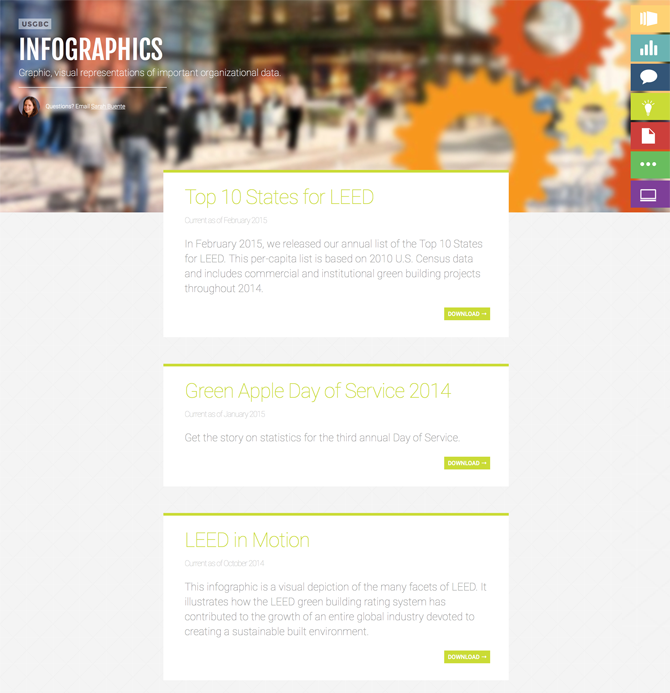 At USGBC, our Marketing team has created a staff portal to improve internal communication. This system allows us to share information and resources across departments more efficiently. Staff can keep up-to-date on the latest statistics and talking points, download aesthetic slide decks and Infographics by topic, and access other important documents—with just one click. As a Marketing Project Coordinator, part of my daily workflow is managing this system, ensuring that the most important resources are accurate and available on the site for other departments. 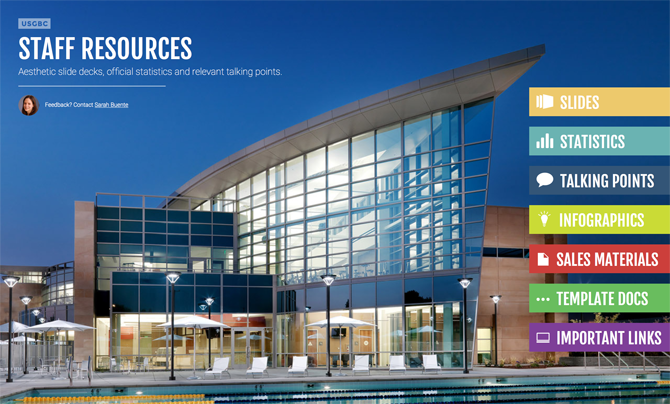 Our Staff Resources page helps our busy department manage our project load more consistently—which prevents us from being inundated with requests by allowing other departments to immediately access the tools they need. Check out an example of a page below to see how our Marketing team is working to improve internal communication daily! Megan is one of our super talented team members who specializes in design and web development. She’s been with USGBC since November, and we’ll go ahead and admit it: we’d be lost without her. I work on our web projects—building microsites, developing user experiences, and researching different digital platforms for future projects. If you could sing one song at Karaoke Night, what would it be? Gemini, which is very fitting considering I sort of have a twin (but not really). I was born on my brother’s 2nd birthday, and we are both artists and lefties. How do you contribute to USGBC’s sustainable efforts in your personal life? In my free time I repurpose materials to make artwork. Specifically, I reuse old magazines by cutting them up and turning them into works of art with a process I call “painting with paper.” I’m also a fan of gadgets that help me live a more environmentally friendly lifestyle. For example, I use a Nest to make sure my home is more energy efficient and I always wear my Fitbit—when I notice I haven’t walked enough on any given day, I’ll walk instead of drive somewhere. Sketchbook, complete poems of Emily Dickinson, snorkel gear. However, if this hypothetical deserted island has electrical outlets and Wi-Fi, this would be the list: tablet (for reading and digital sketching), laptop, snorkel gear (even with gadgets, I might as well explore the area since I’m stuck on an island). When a website doesn’t follow best practices—like overusing iframes, inline styles instead of external style sheets, outdated html tags that aren’t supported in modern browsers, having every link open in a new tab, not properly coding media queries, and overcomplicating a page with lots of columns of text and clashing color schemes. Another big pet peeve is trying to design something that works/looks right in Internet Explorer (also known as one of the most frustrating browsers ever). Our innovative Studio team is comprised of marketing strategists, digital analysts, designers and developers. This supergroup is responsible for making sure that USGBC communicates with the world in the most effective and compelling way while maintaining our standards of sustainability. The only way we can accomplish this is through collaboration. Glad you guys took the time to meet Megan—stay tuned to meet the rest of our talented team members! As a marketing team, we spend a lot of our day generating content and preparing to deliver it to our audience. One of the ways we communicate with our audience is through our articles. This is a great way for us to produce content on a number of topics, and share informative articles that will touch everyone within our primary audience group. We want people to read, share and talk about our articles. With social networks becoming more and more visual, incorporating images into our posts has become a priority. Sharing: We want people to share this information. Social media posts that include images tend to have higher engagement levels than just plain text. It’s way more interesting to look at a graphic than to read a paragraph, right? Total views: Articles that include images get 94% more total views than articles that are just text. 94%. Why wouldn’t you include images with that number? Emotional connection: People say an image is worth a thousand words—they’re right! Pictures can convey emotions and meanings to people that writing sometimes cannot. Selecting an image that touches readers on an emotional level is always a good thing. We also feel that adding images to our articles really keeps our brand consistent. Creating images that are specifically designed for each article topic allows us to keep our brand standards, while also adding value to the post. While articles images may seem like a low priority item when it comes to marketing and communications, we think it’s a pretty important step when reaching out to our readers! Would you rather read an article with some visual interest, or stick to just plain text on your computer screen? When Sunday rolls around the thing I dread the most is thinking about what I will pack for lunches for the upcoming week. It’s a lot of work and a lot of preparation. And the last thing I want to do at 7:00 am as I rush out the door is pull deli meat out of my fridge and slap it between two slices of bread. Yuck. Well, there’s a solution. And not only does it make my life easier, it’s also healthier and better for our earth! Glass > Plastic. Mason jar salads for the win! In what creative ways do you choose glass over plastic? Read more at usgbc.org- link in profile. The salads stay super fresh from Sunday-Friday! Not a joke. I literally build a salad for all five days of the week on Sunday evening. And my Friday salad tastes just as good as my Monday one! And when my alarm goes off at 7:00 am, I can grab my jar and go. I don’t have to worry about harmful chemicals from plastic tupperware finding their way into my food. Let’s face it: plastic tupperware is apparently killing all of us. Toxins tend to migrate from plastic tupperware into food while chilling on a fridge shelf. It also happens the other way around. So my neatly packed lunches are actually transferring germs back into the plastic. Glass jars contain no chemicals that can leach into food, and glass can be safely washed at high temperatures. Glass jars are saving the earth! Well, not exactly. But Recycled glass uses 40% less energy than manufacturing new glass, and up to 80% of all recycled glass can be reclaimed. Not all plastic can be recycled. In fact, only about 6.8 percent of the total plastic used in the U.S. can be recycled. So while my jar full of vegetables in colorful layers may look a little strange in the fridge, it has it perks! It’s also forcing me to save a little money by not eating out. And who doesn’t want a little extra cash in their wallet? Check out some of my go-to recipes below. This post was originally posted on USGBC.org.